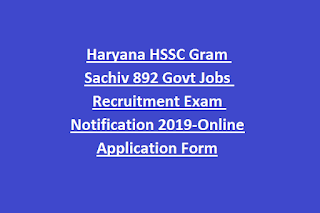 Haryana HSSC Gram Sachiv Recruitment/Exam-2019: Haryana Staff Selection commission HSSC re advertised (Advt No 3/2019) for the available Gram Sachiv jobs in Development and Panchayat Department of Haryana. There are total 435 Gram Sachiv posts are in this HSSC Recruitment 2019. Matriculation/higher Secondary/10+2 vocational qualified candidates are eligible to submit the application online for this HSSC Gram Sachiv Jobs. Online application form is available from 21-03-2019 and closing date is 23-04-2019. Haryana Staff Selection Commission official website to is www.hssc.gov.in to submit the online form. Candidates are selected through written exam and certificates verification for this HSSC Gram Sachiv Recruitment 2019. 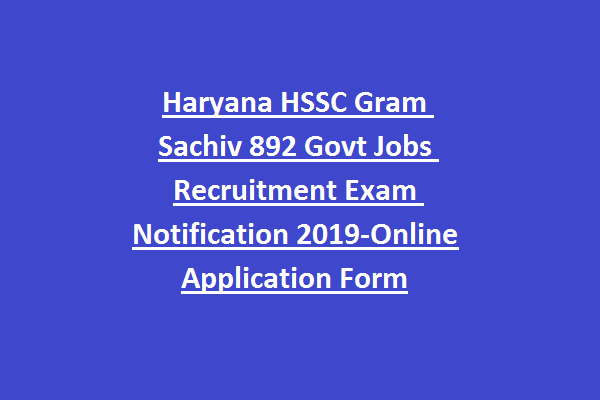 Community wise vacancies, salary, selection criteria and other details of this Haryana SSC Gram Sachiv Jobs Recruitment 2019 is updated below. There are total 435 Gram Sachiv jobs in this Haryana Development and Panchayat Department. Age limits are 17-42 years for this Gram Sachiv posts. Matriculation/Higher Secondary/10+2 Vocational passed candidates can apply online for this HSSC Gram Sachiv Jobs Recruitment 2019. Must have studied Hindi or Sanskrit subject up to matriculation level. An objective mode written exam is conducted for candidates selection for this Gram Sachiv recruitment 2019. Documents verification is conducted for the candidates who are shortlisted in written exam. Exam Syllabus covers the topics of English, Hindi, Haryana State General Knowledge, National and State level and international level Current Affairs, Matric level mathematics (Reasoning/Arithmetic). Apply online for this HSSC Gram Sachiv Jobs recruitment 2019. Online form link will be available on 21-03-2019 and will be de active on 23-04-2019. Official website for this HSSC online form submission is www.hssc.gov.in. from where can i apply for canal patwari & gram sachiv jobs for HARYANA. kindly share the link for the same.